There is a kind of religion in science . . . every effect must have its cause; there is no First Cause. . . . This religious faith of the scientist is violated by the discovery that the world had a beginning under conditions in which the known laws of physics are not valid, and as a product of forces or circumstances we cannot discover. When that happens, the scientist has lost control. If he really examined the implications, he would be traumatized. As usual when faced with trauma,the mind reacts by ignoring the implications—in science this is known as “refusing to speculate”—or trivializing the origin of the world by calling it the Big Bang, as if the Universe were a firecracker. The implication of the creation of the universe out of nothing is that there is a Cause outside the universe with the attributes listed above.That’s not speculation, but following the evidence where it leads. As we have seen, the Law of Causality is the very foundation of science.Science is a search for causes, and that search is based on our consistent observation that everything that has a beginning has a cause. In fact, the question “Who made God?” points out how seriously we take the Law of Causality. It‘s taken for granted that virtually everything needs a cause. So why then ­doesn‘t God need a cause? Because the atheist’s contention misunderstands the Law of Causality. The Law of Causality does not say that everything needs a cause. It says that everything that comes to be needs a cause. God did not come to be. No one made God. He is unmade. 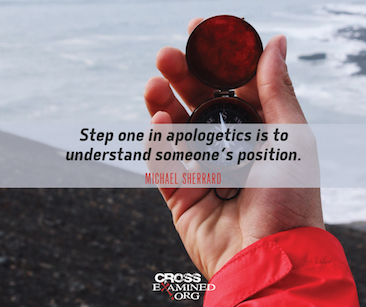 As an eternal being, God did not have a beginning,so he ­didn’t need a cause. The problem for the atheist is that while it is logically possible that the universe is eternal, it does not seem to be actually possible. For all the scientific and philosophical evidence (SURGE– Second Law, Universe is expanding, Radiation Afterglow, Great galaxy seeds, Einstein’s GR–radioactive decay, and the Kalam Cosmological Argument) tells us the universe cannot be eternal. So by ruling out one of the two options, we are left with the only other option–something outside the universe is eternal. When you get right down to it, there are only two possibilities for anything that exists: either 1) it has always existed and is therefore uncaused, or 2) it had a beginning and was caused by something else (it can’t be self-caused, because it would have had to exist already in order to cause anything). According to overwhelming evidence, the universe had a beginning, so it must be caused by something else– by something outside itself. Notice that this conclusion is consistent with theistic religions, but it is not based on those religions– it is based on good reason and evidence. personal,in order to choose to convert a state of nothingness into the time-space-material universe (an impersonal force has no ability to make choices). Who Really Commits the ‘God of the Gaps’ Fallacy? The God-of-the-Gaps fallacy occurs when someone falsely believes that God caused the event when it really was caused by undiscovered natural phenomena. For example, people used to believe that lightning was caused directly by God. There was a gap in our knowledge of nature, so we attributed the effect to God. Darwinists assert that theists are doing the same thing by claiming that God created the universe and life. Are they correct? No, for a number of reasons. First, when we conclude that intelligence created the first cell or the human brain, it’s not simply because we lack evidence of a natural explanation; it’s also because we have positive, empirically detectable evidence for an intelligent cause. A message (specified complexity) is empirically detectable. When we detect a message, like “Take out the garbage, Mom” or 1,000 encyclopedias, we know that it must come from an intelligent being because all of our observational experience tells us that messages come only from intelligent beings. Every time we observe a message, it comes from an intelligent being. We couple this data with the fact that we never observe natural laws creating messages, and we know an intelligent being must be the cause. That’s a valid scientific conclusion based on observation and repetition. It’s not an argument from ignorance, nor is it based on any “gap” in our knowledge. Second, Intelligent Design scientists are open to both natural and intelligent causes. They are not opposed to continued research into a natural explanation for the first life. They’re simply observing that all known natural explanations fail, and all empirically detectable evidence points to an intelligent Designer. Now, one can question the wisdom of continuing to look for a natural cause of life. William Dembski, who has published extensive research on Intelligent Design, asks, “When does determination [to find a natural cause] become pigheadedness? . .. How long are we to continue a search before we have the right to give up the search and declare not only that continuing the search is vain but also that the very object of the search is nonexistent?” Consider the implications of Dembski’s question. Should we keep looking for a natural cause for phenomena like Mount Rushmore or messages like “Take out the garbage, Mom”? When is the case closed? Walter Bradley, a coauthor of the seminal work The Mystery of Life’s Origin, believes “there ­doesn’t seem to be the potential of finding a [natural explanation]” for the origin of life. He added, “I think people who believe that life emerged naturalistically need to have a great deal more faith than people who reasonably infer that there’s an Intelligent Designer.” Regardless of whether or not you think we should keep looking for a natural explanation, the main point is that ID scientists are open to both natural and intelligent causes. It just so happens that an intelligent cause best fits the evidence. Third, the Intelligent Design conclusion is falsifiable. In other words, ID could be disproven if natural laws were some day discovered to create specified complexity. However, the same cannot be said about the Darwinist position. Darwinists don’t allow falsification of their “creation story” because, as we have described, they don’t allow any other creation story to be considered. Their “science” is not tentative or open to correction; it’s more closed-minded than the most dogmatic church doctrine the Darwinists are so apt to criticize. Finally, it’s actually the Darwinists who are committing a kind of God-of the-Gaps fallacy. Darwin himself was once accused of considering natural selection “an active power or Deity” (see chapter 4 of Origin of Species). But it seems that natural selection actually is the deity or “God of the Gaps”for the Darwinists of today. When they are totally at a loss for how irreducibly complex, information-rich biological systems came into existence, they simply cover their gap in knowledge by claiming that natural selection, time, and chance did it. The ability of such a mechanism to create information-rich biological systems runs counter to the observational evidence. Mutations that aren’t neutral are nearly always harmful, and time and chance do the Darwinists no good, as we explained in chapter 5. At best, natural selection may be responsible for minor changes in living species, but it cannot explain the origin of the basic forms of life. You need a living thing to start with for any natural selection to take place.Yet, despite the obvious problems with their mechanism, Darwinists insist that Natural Selection covers any gap in their knowledge.Moreover, they willfully ignore the positive, empirically detectable evidence for an intelligent being. This is not science but the dogma of a secular religion. One could say that Darwinists, like the opponents of Galileo, are letting their religion (or at least their philosophy) overrule scientific observations. When I debated atheist Christopher Hitchens, one of the eight arguments I offered for God’s existence was the creation of this supremely fine-tuned universe out of nothing. I spoke of the five main lines of scientific evidence—denoted by the acronym SURGE—that point to the definite beginning of the space-time continuum. They are: The Second Law of Thermodynamics, the Expanding Universe, the Radiation Afterglow from the Big Bang Explosion, the Great galaxy seeds in the Radiation Afterglow, and Einstein’s Theory of General Relativity.